Nvidia's snuck in one last driver update before the holidays as a little gift for Battlefield players. GeForce hotfix driver version 376.48 swats away a few bugs, including two that pertain to Battlefield 1. 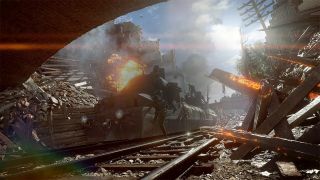 One of the bug fixes related to Battlefield 1 deals with multiple issues that could cause the game to crash. If you've been having trouble getting the game to stay up and running, you may want to give this hotfix a try. The other one deals with SLI texture flickering in Battlefield 1. This has been an ongoing issue ever since EA released its fall patch back in November. If you're still experiencing the issue and don't want to turn off SLI, same advice as above—try your luck with this hotfix. Applying the hotfix is also supposed to solve random flashes in Just Cause 3 and corruption in Wargame: Red Dragon. On top of game fixes, the hotfix includes a workaround that addresses an issue in Folding@home. Before this release, Folding@home users were stuck using Nvidia's GeForce 373.06 drivers released around the middle of October. You can find the 376.48 hotfix here.